When Will I Get My Sell Sheets? 500 to 5,000 Sell Sheets: Ships or ready for pick up in 2 business days from proof approval. Under 500 Sell Sheets (printed digitally): Ships or ready for pick up in 1 business day from proof approval; UV coating requires 1 additional day. Over 5,000 Sell Sheets: Ships or ready for pick up in 5 business days from proof approval. Professionally printed sell sheets are critical to making a good impression with customers. Choose the online sell sheet printing service of 48HourPrint.com and know that you’re getting high quality sell sheet printing at amazingly affordable prices. In addition to great quality and prices, enjoy the convenience of our industry-leading 48 Hour Turnaround Guarantee for quantities of 5,000 or fewer sell sheets and our 24 Hour Turnaround Guarantee for quantities fewer than 500 sell sheets printed on our digital press. Sell sheet printing lets you economically market your organization and its products and services. Individual sell sheets are perfect for educating customers and prospects about the features and benefits of each of your products and services. Tailor your marketing package for each prospect by including appropriate sell sheets in a printed pocket folder. Well-designed, eye-catching sell sheets attract attention at trade shows and conferences and project a positive image of your organization. Include compelling copy and an effective call to action, and your sell sheets will keep your target market engaged. Preserving the environment is important to 48HourPrint.com. Our full-color, two-sided sell sheets are printed on recycled paper, which delivers excellent sell sheet printing results on paper that is brighter and more uniform in color. Recycled paper is our standard stock, at no extra cost to you. Sell sheets are printed on high quality 100# text stock with gloss coating, high-gloss U.V. coating, or matte coating. Sell sheets also come in three sizes to suit your needs. 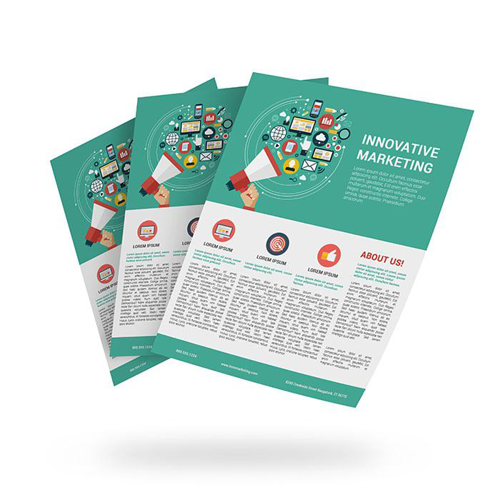 For more sell sheet promotional tips, check out our sell sheet marketing ideas. Also review our sell sheet templates for layout guidelines that will help keep your project on schedule.